From my experience, players in Fallout 76 are either complete assholes or very awkward to communicate with. When you fall in love with a franchise, game company, or even a TV show, you eagerly look for the new content that will be produced by that revered source. Feverishly, you crave that series and you become excited about everything made by the creators that captured your heart with their great minds. But what if what they produced something that fell short of your expectations and left you dissatisfied? As an enthusiast who admires the apocalyptic worlds in the Fallout series, this is exactly how I felt upon receiving Fallout 76. When the hype train came to a stop on November 14th, many gamers found themselves baffled by what 76 had to offer. I had my doubts, but I was open to trying something new. What I truly enjoyed about Fallout was missing in Fallout 76, but I still had faith in the game. Fallout is filled with rich narrative, questlines, and wholesome adventure. Sadly, Fallout 76 doesn’t reflect that world at all right now. Fallout 76 may have been an amazing idea on paper, but to be frank, it’s boring. The quests included in the game are so repetitive that your mind becomes numb. To elaborate, Fallout 76 doesn’t have interesting characters to talk to, it’s mainly a cesspool of other real players. The nature of the Fallout series shouldn’t rely entirely on other players to make the game enjoyable. Players shouldn’t have to give out quests or assume the role of key characters in the “story.” The players are here to play the game, roam around the world, build, fight, and experience the game in their own way. Other Fallout games that we’ve grown to love had interesting back stories that you could uncover on your own. Where is that magic when all the intriguing AI is gone? What backstories do real players have in the world of Fallout? When things change so drastically, and you’re not used to it, there’s a risk that you may dislike it. And for Fallout 76, I immensely disliked it. The large number of new things Fallout tried brought it to its downfall. Unlike the other Fallout games, there are no NPC’s to interact with in order to get quests, or simply to talk with and learn their backstory. Aside from robot vendors with silly puns, this large world feels abandoned. It becomes almost impossible to manage the quests you do have, because they pile up endlessly without a means of organization. There are no people to check back with to remind you that they need their quest done, or to set your priorities in a unique way. Quests are what progress you through the premise of the game. But it doesn’t feel like there’s a reason to complete them. This brings me to my next point: there is no engaging story. In Fallout 76, the player unravels the story behind the barren radioactive West Virginia by running around and listening to tapes. The overseer, the person who was in charge of your vault, notices that something strange is up with the world. Everybody is gone and the reason behind that is evidently a Scorchbeast, a monster with breath that burns people alive and turns them to black statues that crumble to dust if touched. With the issue of an uninteresting story about an elusive monster just like the rest of the wasteland creatures, there’s an issue with navigating the story. To simply put it, I don’t think running around listening to tape recorders is the best way to uncover a narrative. It’s unengaging, not immersive, and monotonous. Third and worst of all, the game is entirely multiplayer. I’m not against multiplayer completely, but I still get Ark Online PTSD just thinking about it. With no camaraderie with NPC’s and the long drawn-out walks to different objectives, you are very likely to run into another player. And from my experience, they are either complete assholes or very awkward to communicate with. Within the first few minutes of my gameplay, I was shot at and hit with a fire axe by a group of people. I refused to fight, but I also refused to die from simply minding my own business. After a brief chase, though, they started emoting and invited me to join their team. I was fairly confused – was I being taken hostage or not? To avoid any further awkward and rather scary interaction with these individuals I chose the solution of pretending I was AFK until they left me to stand in the street and I left the game. It’s not fun when a higher leveled player casually swoops down to assault your base and walks away unscathed because you can’t do anything about it. The only feature that truly made the game fun was playing with friends. Talking to them with their innate sense of humor and exaggeration of small events gave my Fallout 76 experience the flare it needed. With tainted water all around us on the pale ground, we explored an abandoned water park. I’m obsessed with reptiles, so I immediately noticed a watery alligator rollercoaster. As we ran up the ramp and entered the giant cartoon alligator, we all laughed as we stepped in the armed bear traps littered within it. I had to perform a rescue mission as my friends climbed up a broken water slide only to be met by a sea of Mirelurks set to kill. We even took a family portrait together and got angry when one person didn’t pose correctly. While my friends were occupied building our little shack in the dark of night, I decided to go exploring to find some purified water. I noticed a large shadowy creature on the cracked road ahead, standing still in the distance. The two large purple circles it had for eyes were so bright that I initially mistook it for a semi-truck. But lo and behold, it was actually the legendary Mothman, staring at me menacingly. I walked up to it cautiously as I have a huge fear of bugs – as it continued beaming at me. A few minutes later, I had taken a pretty cool selfie with the Wise Mothman. Although it didn’t speak, I could tell that its personality is just as bright as its eyes. My friends were very jealous of my photo, but sadly, I was reminded of the barren nature of this game when I arrived at the Mothman Museum, which looked so cool on a poster I’d seen earlier, to find that absolutely nothing was there. My friends giggled at my dismay, which was the only thing that made me smile. Who wouldn’t want to explore the radioactive wasteland of America with their friends? 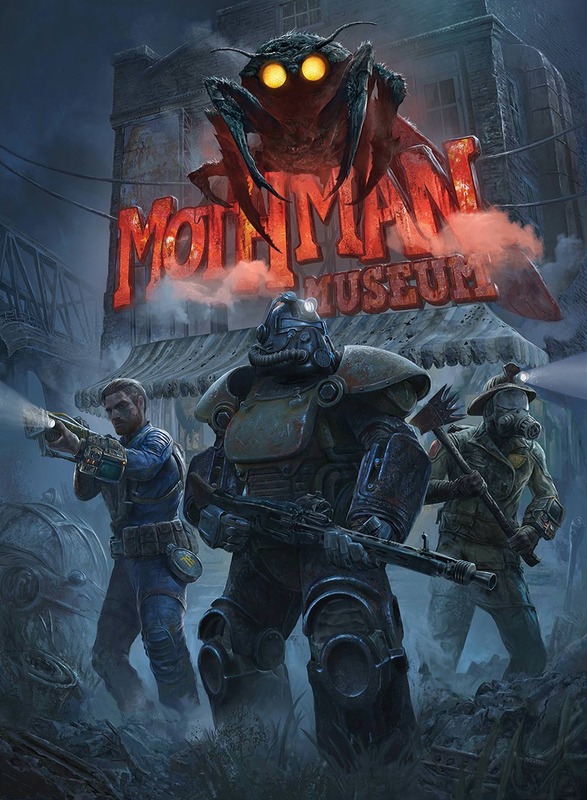 Horribly mutated creatures and robots roam the great barren hills of West Virginia and as you and your friends emerge from Vault 76, it’s up to all of us to survive and rebuild this great nation. As great as that adventure may sound, what we got instead was completely underwhelming. That doesn’t mean I distrust the Fallout series, Bethesda, or Todd Howard. I simply would rather play the game portrayed in the original trailer, which promised an engaging story with the intriguing premise of rebuilding an entire nation that we could enjoy with our friends for the very first time. I hope they’ll add brilliance to the game over time. But right now as it is, the world is not enough.